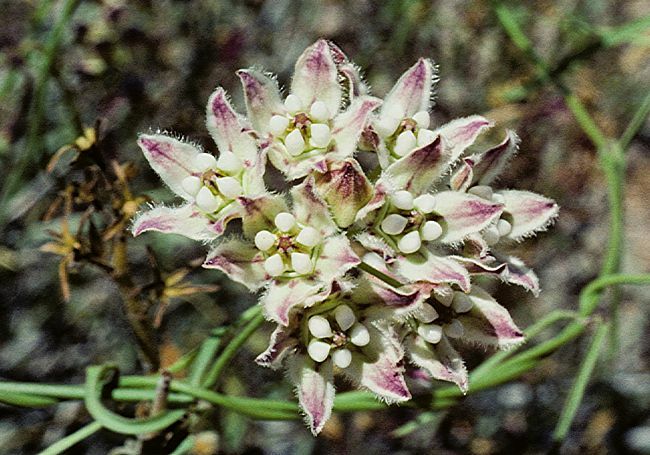 The genus Cynanchum has contained as many as 400 species but currently includes about 300 species of twining herbs or sub-shrubs that scramble through other vegetation. 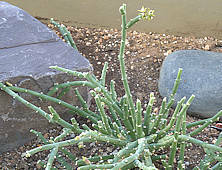 Most species are non-succulent. Roots are often rhyzomes, leaves are opposite, flowers have the specialist pollination mechanisms of the milweed family and are followed by pairs of follicles. 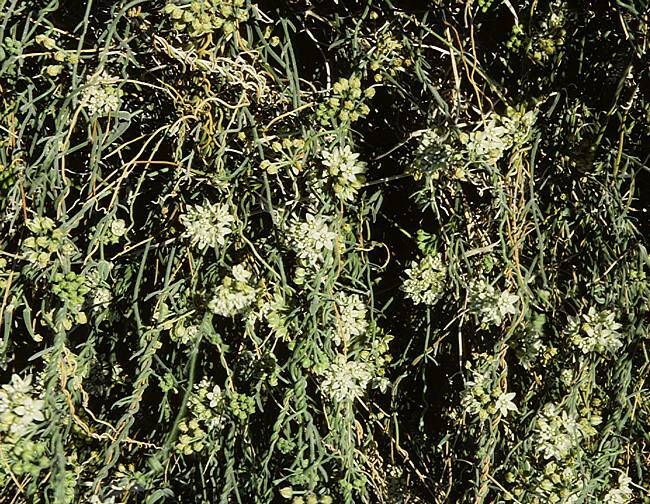 Some species of Cynanchum are listed as invasive weeds. The sap of some species is caustic or toxic but a few species have supposed medicinal properties and Cynanchum atratum root features in Chinese traditional medicine 'Bai wei' to treat fever and as a diuretic. Greek: sarx / sarkos = flesh + stemma = crown or wreath / garland, from the fleshy inner corona. The genus Sarcostemma is a group of about 40 species of climbing vines and sub-shrubs with leafless or leafy photosynthetic stems. Leaves where present are opposite and heart-shaped to lanceolate. Umbels of small flowers arise from leaf nodes. 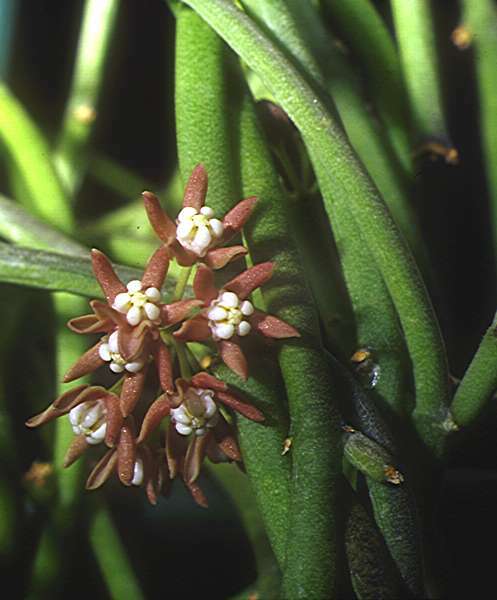 The genus Sarcostemma as originally constituted was widely distributed throughout the sub-tropical and tropical Old World in Africa, India and Malaysia. Recently Sarcostemma was reduced to a synonym of Cynachum and many species moved to other genera. 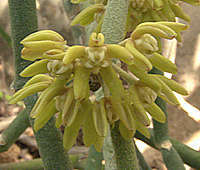 Sarcostemma viminale is very common in southern Africa. Similar New World species are regarded as Funastrum in some taxonomic treatments, but may be seen assigned to either genus. The leafy tropical American genera Philibertia and Vincetoxicum have been included under Sarcostemma, but are currently recognised in their own right. Several species in this group are listed as invasive weeds and are best cultivated in pots with a climbing frame, where they can be kept under control. 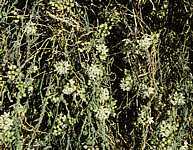 The milky sap is toxic and Sarcostemma australe (Caustic Vine) blisters skin on contact. Some species may contain substances of medicinal value. A group of about 16 species climbing vines with photosynthetic stems, native to the tropical and sub-tropical Americas. Roots are fleshy rhyzomes. The soft opposite leaves and other parts are often slightly hairy. Widely-distributed across the Southern USA from Florida to California, commonly twining through shrubs, fences and other supports. The greenish-white to pink petals are fringed with white hairs but the stems and lanceolate to heart-shaped leaves are smooth. Flowers are followed by pairs of pods full of seeds with silken parachutes. This plant is attractive to bees, butterflies and birds but may be an invasive weed in some areas. Photographed in the Desert Botanical Garden, Phoenix. 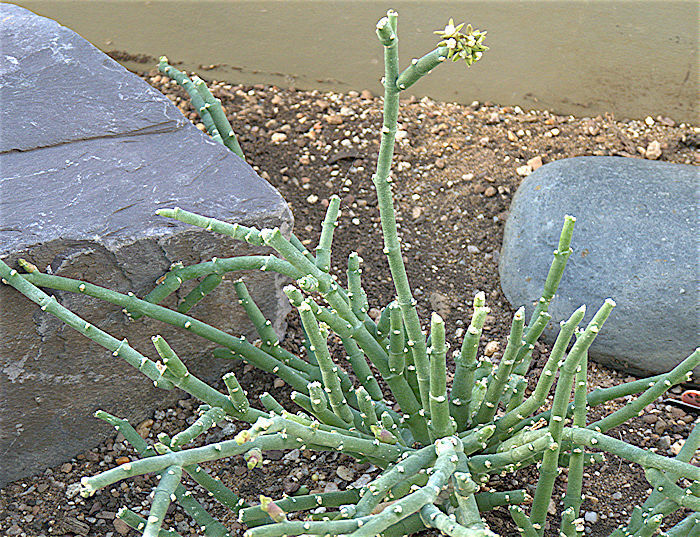 A widespread vining plant of the lower desert in South-Western USA and North-Western Mexico. 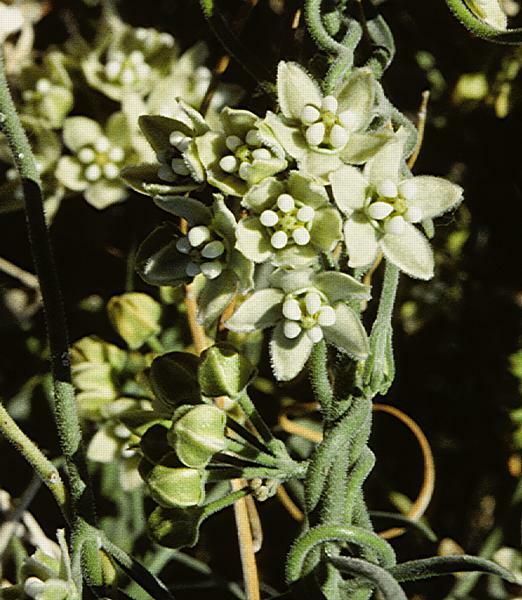 The white petals are fringed with white hairs and the twining stems and sparse lanceolate leaves are pubescent. May be an invasive weed, swamping other vegetation. Photographed in the Joshua Tree National Park near the Teddy Bear Cholla forest. 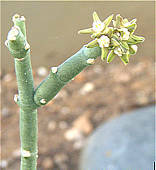 This Cynanchum forms a clump of green branching photosynthetic stems with short internodal distances between the joints. 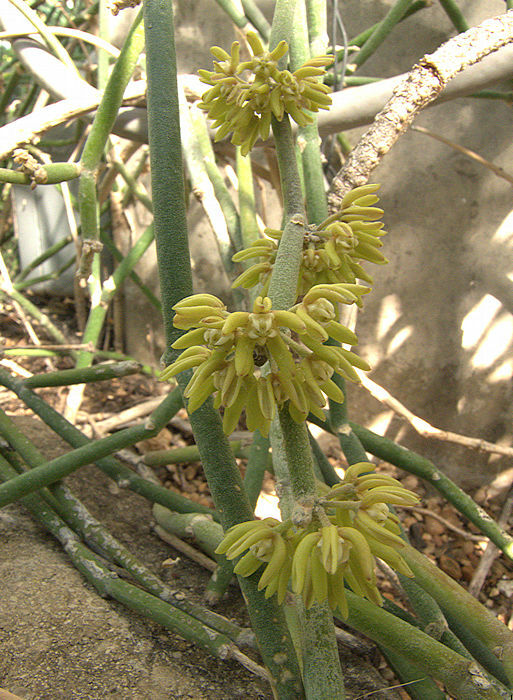 Clusters of small yellowish flowers with white centres are produced at stem joints and at the ends of stems. Native to Kenya and Northern Tanzania. This species from Kenya and N. Tanzania has narrow stems up to an eighth of an inch in diameter. In a sunny location, clusters of small pinkish to brownish flowers are produced freely during the summer. Needs a small climbing frame to keep it under control. A robust species with leafless cylindrical photosynthetic stems up to a quarter of an inch in diameter. The stems tend to explore and scramble through their surroundings, rooting as they go, but can be confined to the footprint of a plant pot with a climbing frame and some creative basket weaving. 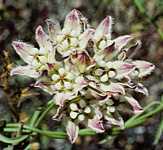 The cream-coloured flowers are sweetly scented and are followed by pairs of long pods packed full of seeds with silken parachutes that promote wind dispersal. This succulent plant is widely distributed acrosss Tropical and Southern Africa, the Middle East to India and South-East Asia, Australia and some tropical islands including Mauritius, Réunion Island and the Seychelles. It is very variable across its range with many sub-species. In some places it is listed as an invasive weed and the sap should be regarded as caustic and capable of burning human skin, although the extent of this seems to be variable. Despite its toxicity, all parts of the plant have been used in traditional medicine and as animal fodder.